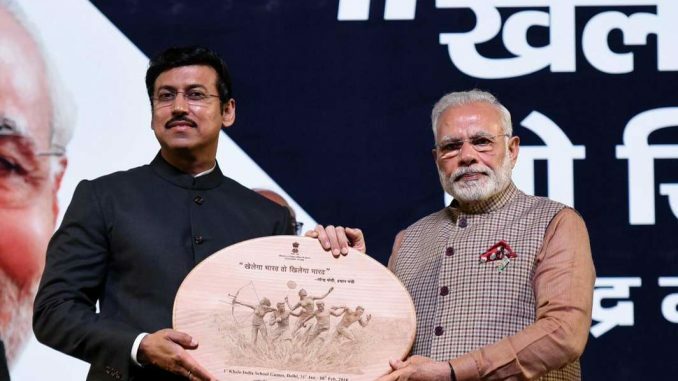 NEW DELHI: Prime Minister Narendra Modi on Wednesday declared the inaugural Khelo India School Games open and said the event will highlight the country’s sporting talent and its potential to the world. Modi declared open the KISG at a colourful opening ceremony at the Indira Gandhi Stadium here. The ceremony showcased the rich ‘Guru-Shishya’ tradition of the country in grand style. Addressing the gathering, the Prime Minister said sports should occupy a central place in the lives of the country’s youth. “Sports is an important means of personality development and Khelo India is not a programme, it’s a mission. The Games will highlight India’s young sporting talent and showcase India’s sports potential,” Modi said. “Khelo India is not only about winning medals. It is an effort to give strength to a mass movement for playing more. We want to focus on every aspect that would make sports more popular across the nation,” he added. Modi urged the youth to take up to sports actively as it is an important tool for the development of the nation. “When we say India has to grow on the world stage, it does not only mean having a strong army & powerful economy. It includes people of India distinguishing themselves as scientists, artists, sportspersons. And, I am confident India will scale these heights. I trust our youth,” the Prime Minister said. He exhorted youngsters to devote time to sports amid their busy schedules. “In your busy schedules, devote time to games, give priority to playing. Today, we have in our midst eminent sportspersons. I am sure they would have faced many obstacles but they did not give up and went on to distinguish themselves,” Modi said, referring to the sports stars and their coaches present on the occasion. Modi said it was gladdening to see youngsters from rural India and smaller cities excelling as sportspersons. He called upon the need to give emphasis on the grassroot level and said his government would provide every possible help to talented youngsters. “These are also youngsters who need support, which we want to provide. We need to organise games at the school level on consistent basis and keep their records, select the best out of them and train them. “We have decided to select 1000 kids every year from different sports and provide them Rs 5 lakh per annum for 8 years,” he said. Modi also announced that his government has decided to reward the childhood coaches of sportspersons who excel at the world stage for the country. “Coaches should be recognised, especially childhood coaches who have unearthed them and helped them grow in their area. So we have decided to reward every coach of a sportsperson who bring laurels for the country,” the PM said. The Prime Minister also read out the Khelo India Pledge before the audience. Sports Minister Rajyavardhan Singh Rathore made the opening remarks and said from now on KISG will be an annual affair. “The Khelo India Games will be held every year and will be broadcast live every year,” he said. Also present on the occasion were Delhi Lieutenant Governor Anil Baijal, Indian Olympic Association President Narinder Batra, School Games Federation of India President Sushil Kumar, among others. The KISG will be held across 16 disciplines in the Under-17 age category and 5,000 school children from 29 states and seven union territories will participate in the event from January 31 to February 8. A total of 199 gold medals, 199 silver medals and 275 bronze medals will be at stake in the first KISG.